As with any weapon it was vital that those using them needed regular practice exercises to ensure they were ‘battle ready’. 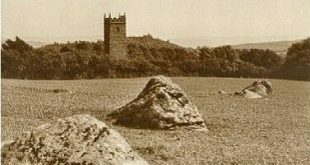 In 1873 the military began artillery training on Dartmoor and in 1875 North Dartmoor became a licensed as a permanent training area with the Okehampton Camp being built in 1893. As a matter of safety the public have always where possible been kept well away from the training areas when exercises were taking place. In a way these have always created an air of mystery as to what exactly is happening when the sound of gun fire can be heard. Today one can only imagine the spectacle that teams of horses, limbers, wagons and heavy guns would have made. Add to that the sight and sounds of the heavy guns being fired and the impact of their shells as they burst over the landscape. Admittedly signs of their devastation can still be seen today in the form of overgrown shell craters and very occasionally the discovery of un-exploded shells. But what would it have been like to witness one such early artillery training exercise with its soldiers, horses and guns in action? As with any training exercise every effort is made to make them seem like a real battle scenario and at times great lengths to make them as realistic as possible. In the June of 1912 an exercise took place on Dartmoor part of which involved the 35th Field battery of the Royal Artillery. The big howitzer guns were situated at Cullever Steps with their muzzles pointing across to Dinger Tor. The horses were drawn up for safety in a sheltered spot nearby. The targets that the big guns were firing at represented enemy infantry but initially their location was unknown to the gunners. The officers were stationed on Yes Tor who then relayed messages to the battery as to where they should drop their shells, this was done by either telephone, semaphone or morse code. The results of the shelling were then relayed back to the officers by the men in control of the targets. “The bang of the guns awoke echoes over the tors, and then puffs of blue smoke high above the moor indicated the direction of the shells.” During the exercise two other batteries, the 55th and 31st R.A. were engaged in a different scenario around Higher tor. Another part of these exercises was an artillery bombardment on the village of Oxhead. If you look on any map of the time you will find no evidence of this village that’s because it was a dummy village which took two months to build. The ironic factor here is that although the construction of the village took weeks it would only take less than half a day to destroy, such were the efforts in striving for realism. From Higher Tor the ‘village’ took on the appearance of a huge white patch laying flat on the ground which covered between 15 and 20 acres in extent. Prior to the bombardment and as if by magic the village would literally rise out of the moorland landscape by means of wires attached to the canvas ‘buildings’. These included; cottages, an inn, a windmill, a church and a hospital. When the bombardment took place the aim of the gunners was to demolish all the buildings whilst leaving the hospital intact. Today with laser guided missiles this would be a relatively easy task but back in 1912 it demanded precision accuracy. On the intended day of the attack there was some doubt as to whether it would take place due to the vagaries of the Dartmoor weather. The previous night a mighty gale howled across the moor, so strong were the winds that several of the marquees at the camp were flattened. Come day break heavy rain mixed with hail drenched the moor and it seemed as if there would be no firing that day. However eventually handkerchief-sized pockets of blue sky appeared over Yes Tor which was the signal to harness the horses and move out to Halstock. Meanwhile a party of men was dispatched to the village in order to erect the buildings. Unfortunately when they arrived it was discovered that some of the canvas fronts belonging to the mock cottages had been damaged. Instead of lying on the ground with the fronts facing skywards they had been inverted. Some of the other cottages had their fittings which fixed them to the ground broken. At the time the authorities were unsure as to whether the damage had been caused by ‘visitors’ to the village or if it the terrific storms were to blame. To make matters worse the strong winds had returned and when the men tried to hoist up the buildings they were nearly blown flat so it was decided to cancel the much awaited destruction of Oxhead village. Here is an account of another exercise which took place in 1936 as witnessed by a local newspaper reporter who was allowed access to the Okehampton range:”Dartmoor valleys re-echoed the crashes of detonating shells when 4.5in. howitzers and 18-pounder field guns of the 18th Field Brigade, R. A. went into action on the ranges near Okehampton yesterday. The sky was at intervals studded with the smoke-clouds of bursting shrapnel, and at other points masses of peat were thrown high into the air by rounds of high explosives. Moving tank targets were rent by flying splinters of metal and were thrown from erratic courses by repeated concussions. Unlimbering near Halstock, two batteries of howitzers and field guns went into action in line, but under distinct control.. Men and horses worked in harmony to place the pieces in position, and within a few moments barrels were moving in response to direction from the battery commander’s posts. Ranges were between 2,000 and 4,000 yards, and, the necessary calculations made, preparations for firing were quickly completed. Shells were taken from limbers to the right of each gun and placed in breeches with speed and efficiency. A crisp command from the fire-control position on the right flank of the Howitzer Battery, and the first high explosive shell went hurtling through the air. Visible, until it reached the peak of its trajectory, it fell in a bog near East Mil Tor. A pillar of peat and smoke leapt into the air, and some seconds later the sound of the explosion reached the gunners. Muzzles flashed in succession at an order for battery fire, and at 30 second intervals eight projectiles were discharged at an area only a few yards in extent. Meanwhile field-guns had been ranged in readiness for a shrapnel ‘shoot’ at the terraced ridges to the south-east of High Willhays. They were fired almost simultaneously, and before the smoke had drifted from the muzzles four puffs of smoke had appeared above the crest on one height. A calibration exercise for all pieces followed further firings at varying ranges, and an advance by the field guns was then ordered. Gun teams which had awaited completion of the exercise at the rear, approached the weapons at a gallop, and were limbered up with quiet efficiency. Iron-shod hooves and wheels rang against granite as the battery moved forward to a position at the bases of West Mil and Rough Tors, where the guns were again prepared for action. The tank targets, drawn at the end of a wire coupling about I mile in length, emerged into ground broken only by boulders, and swaying to all angles were fired at over ‘open sights. A satisfactory degree of success was attained and the fabric sides of the targets were repeatedly torn by the projectiles. The operation completed the battery returned to camp as other units of the brigade made their way to the ranges for commencement of a further shoot. The 18th Field Brigade, R. A., is stationed at Deepcut, and consists of the 59th, 93rd, and 95th (Howitzer) Batteries.” – The Western Morning News, June 16th, 1936. Whilst viewing such spectacles from afar must have been an amazing sight it would be a completely shocking experience to accidentally witness one from the receiving end. In 1893 a party of three tourists had set out on a hike from Gidleigh to Cranmere Pool. This was back in the day when such things a red flags, danger zones and range wardens had been introduced and clearly demonstrates why they came into being. “They were firing from the camp at Okehampton, and from where we stood we watched the shot strike a hill some two miles away, while a random one fell some half-mile off, causing us to change our direction, and approach the pool from more protracted ground. We heard the guns until one o’clock when they ceased. At half past one they recommenced, by which time we were in close vicinity to Cranmere, and we were alarmed to hear the shriek of the shells followed by the thud, as they dropped within a few hundred yards of us. The locality in the watershed of the moor, and the ground is seared by innumerable crevasses down which the water finds its way to the Taw and Okement rivers. In one of these fissures we took shelter, but was soon driven out by a shot striking the ground a few hundred yards behind us, scattering the peat over our heads. None of these crevasses are, indeed, deep enough to afford the protection sought for, but only serve to render the ground exceedingly difficult to cross. To speedily get out of range was, therefore impossible, and for half and hour – that is, until two o’clock, when the firing ceased – we were struggling over the broken ground under heavy fire, with the shells screeching in every direction. Two fell withing ten yards of us and a dozen must have fallen within fifty or a hundred yards, while a countless number more went tearing through the air above or to one side of us. If directed at the pool, so precise was the fire that two shots while we passed entered the banks. That none of our party were either killed or injured was a pure piece of luck, and yet we were in a part of the moor well known to be traversed by the public at least five miles from the camp, with no sort of warning by way of flags or signals of any kind that danger was to be apprehended.” – The Western Times, August 23rd, 1893. It is said that every cloud has a silver lining and in the case of the Big Guns these provided some local men with a modest income. In the July of 1899 seven men were brought before the Tavistock Petty Sessions charged under section 7 of the Public Stores Act with having in their possession certain goods. It transpired that at the time it was common practice for some men to go up to the ranges following artillery practice and collect the more valuable metal pieces of the exploded shells such as copper and brass. Clearly this little sideline was inherent with danger and was one which the War Office wanted to stop. At the trial the Camp Commander stated that an example should be made of the offenders in the hope that it would deter others from doing the same. However, in the end the defendants promised to cease and desist their dangerous occupation and were ordered to pay the costs. Being slightly cynical one of the witnesses at the hearing was George Endacott a range clearer from Hartor farm. He stated that; “he had certain privileges granted to him by the camp authorities,” this referred to the fact that the range clearers received 2 shillings and six pence for every unexploded shell they discovered and reported its location. Quite sensibly and for obvious reasons this incentive did not apply to any civilians and non-authorised people. Rather sadly with such a dangerous occupation it was not an explosion that killed Mr. Endacott, he fell off his pony when it shied at a saddle left in the track at at Cullever Steps and died from his injuries. An excellent free booklet in pdf format details the history and many aspects of military training on Dartmoor and can be downloaded – HERE.